This time last year, Ohio State's wrestling team felt it had a date with destiny. Fielding perhaps the most-talented line-up in school history, anchored by a trio of soon-to-be four-time All Americans, Tom Ryan's team looked like what a national championship team should look like. But for the seventh time in eight years, Cael Sanderson's Nittany Lions hoisted the trophy. This year's team looks much different - Kyle Snyder, Bo Jordan and Nathan Tomasello are gone from the roster, leaving talented first-year starters in their places. The expectations are nearly as high, however, as the Buckeyes went wire-to-wire as the No. 2 team in the country in most tournament-based ranking systems. Most programs would look at the year after three of the most-decorated wrestlers in school history graduated as a rebuilding year... Ohio State looks askance at reloading years. The new-look Buckeyes of 2019 finished the regular season 12-2 in dual-meet action, dropping a tight battle at home to That Team Up North and suffering a blowout to the defending NCAA Champions from State College. 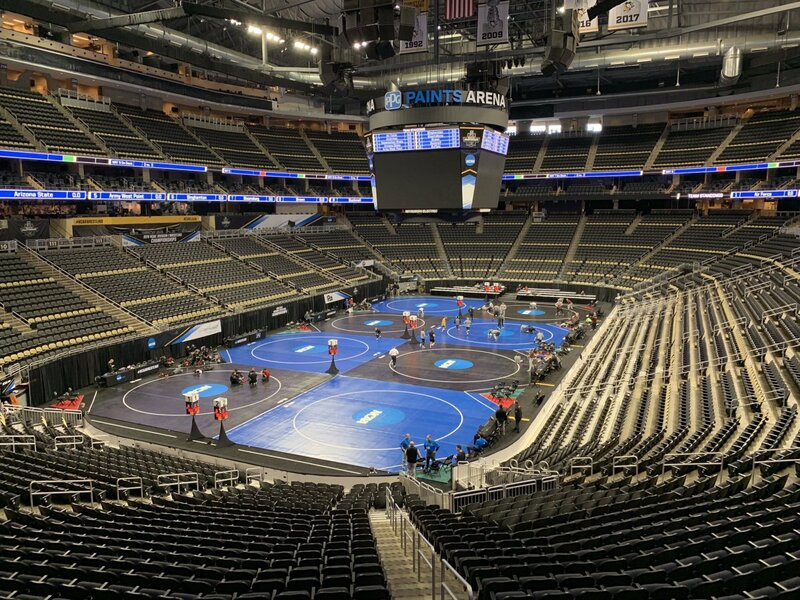 None of that matters now: all that matters now is the next 60 hours, in which 330 wrestlers from 70 teams compete in 640 individual matches to decide who will be crowned NCAA Champion. Ohio State is the only team in the tournament with all 10 wrestlers competing for a title. It marks the second year in a row that the full roster earned a bid to the NCAA tournament, either by earning an automatic bid at the Big Ten Championships or as an at-large selection. Tom Ryan's teams have brought home hardware from each of the last four NCAA Wrestling Championships, including the 2015 team title. In three years since taking the crown, the Buckeyes have placed third; Ryan has guided the program to top-10 finishes in 10 of 12 seasons since he arrived in Columbus. In addition to the recent stretch of top-3 placements (2016-18), Ohio State also claimed runner-up honors in both 2008 and 2009. From an individual standpoint, at least one Buckeye has earned an NCAA Championship for seven straight seasons. Four-time champion Logan Stieber began the title-clinching streak as the 2012 champion at 133 pounds, and Kyle Snyder picked up his third NCAA title in Cleveland a year ago. Senior Myles Martin is the most-likely man to extend the streak, entering this year's field as the No. 1 seed at 184 pounds and eager to bookend a career that started with an NCAA title won as a true freshman at 174 pounds... from the No. 11 seed, no less. Joey McKenna, Micah Jordan and Kollin Moore would like to add their name to the list as well, each having earned a No. 2 seed in their respective weight classes. For senior captains McKenna and Jordan, this is their last shot to win an NCAA final. Heinselman is the lone true freshman on this year's roster, and comes into his first NCAA tournament with a respectable 23-9 record and having earned an automatic bid at the Big Ten Championships. He is a year ahead of schedule on the roster; the staff had originally planned to redshirt him, but decided mid-season that he was not only the team's best chance at a productive postseason, but that there was little reason to keep him on ice instead of gaining live-fire experience against the best in the sport. His path to making the All-America podium is... challenging. After Arizona State's Ryan Milhof withdrew from competition due to an injury sustained during practice earlier in the week, Heinselman moved up a spot in the seeding and now opens his tournament with a rematch against Cornell standout Vitali Arujau. Arujau got the better of Heinselman in a 6-0 decision in the dual meet a month ago, and comes into the tournament with a record of 26-2 on the year. His only losses came against Patrick Glory of Princeton and Cornell teammate Charles Tucker, who will represent the Big Red at 133 pounds in Pittsburgh. If Heinselman should get the better of Arujau and advances, he'll face the winner of Michigan State's Rayvon Foley and Rico Montoya of Northern Colorado. If he drops into the consolation bracket after the first round, he will take on the loser of that same match. Pletcher is the first of Ohio State's five returning All Americans competing in Pittsburgh. He finished fourth in Cleveland, and comes into this year's tournament with a record of 23-5. The junior from Latrobe, Penn., is one of three Pennsylvania natives wrestling in scarlet and gray this week, and should have plenty of home-state support on hand. He'll open the tournament versus Kent State's Tim Rooney in the Round of 32, and looks to be on a clear course for a quarterfinals bout against No. 4-seed Mickey Phillipi of Pittsburgh in front of his home crowd in PPG Paints Arena. Phillipi handed Pletcher his first loss of the season, back at the Cliff Keen Las Vegas Invitational in the season's opening month. From there he would most likely face No. 1 seed Daton Fix of Oklahoma State. Fellow 133-pound Big Ten standouts Stevan Micic, Nick Suriano, Austin DeSanto, Ethan Lizak and Roman Bravo-Young are all in an absolutely brutal bottom-half of the bracket. Fresh off winning his fourth conference championship - a pair each in the Pac-12 and Big Ten - Joey McKenna is on the precipice of the one goal to elude him thus far: an NCAA title. The New Jersey native and former Stanford star came to Columbus to compete for the sport's top collegiate honors, and is in position to accomplish that goal Saturday. To get there, he'll have to get past possible rematches with Oklahoma State's Kaid Brock Thursday night, Mitch McKee of Minnesota in the quarterfinals Friday, and then Penn State's Nick Lee in the semis. On the other side of the bracket he expects to see undefeated defending NCAA Champion Yianni Diakomihalis of Cornell with the goal of avenging last month's dual-meet loss in Ithaca. Like Pletcher and McKenna, Jordan is another returning All America finisher from last year's star-studded team. His only losses this season were to top-seeded Anthony Ashnault of Rutgers, the man he seems most likely to face in Saturday night's final. To get to that match he'll have to get past likely quarterfinals opponent Pat Lugo of Iowa and then Duke's Mitch Finesilver in the semifinals. He'll be expected to add some bonus points to the Buckeye team tally in the early rounds: Nineteen of Jordan's 25 wins this season have come with bonus points attached, including six pins and six technical falls. Jordan now ranks among the Top-15 Buckeyes all-time in winning percentage, and his 27 career pins are one shy of cracking the school’s Top-10 as well. One of the 2018 tournament's toughest draws provided Hayes with an early exit in Cleveland. He drew No. 1 Zain Retherford in the championship bracket, and followed that up with the recently-upset Iowa standout No. 2 Brandon Sorenson. His path to All-America status this season is infinitely smoother by comparison. After an opening bout versus Ohio University Bobcat Zac Carson, Hayes would likely face Kaleb Young of Iowa, the 6th seed, followed by a rematch with Ryan Deakin of Northwestern. Tyler Berger of Nebraska is also in Hayes' half of the bracket, while Hayden Hidlay and Alec Pantaleo get to fight their way toward a battle with Jason Nolf in the top half. Hayes has had one of the roughest careers of anyone on the roster: Starting as a promising 141-pounder three years ago, his season was cut short due to injury. He moved up to 149 pounds after losing a wrestle-off to Joey McKenna last season, and then moved on up to 157 this year after coming up short in the wrestle-off to Micah Jordan. In his new weight class, he's faced the toughest schedule of anyone on the team, having faced ranked opponents a staggering 15 times, including 11 of his last 12 matches. The ballad of Te'Shan Campbell's collegiate career will draw to a close in his hometown. It seems fitting that the former Pitt Panther should wrestle in his fourth NCAA tournament in the Steel City, and he'll hope to have the best finish of his career in front of his friends and family back home. Campbell's season saw him starting the year at 174 pounds in a battle with Ethan Smith, but then dropping back down to 165 when it became clear that Kaleb Romero wasn't ready for primetime at that weight. The senior enters the tournament with a season record of 20-7, but with a disappointing 0-6 mark against ranked opponents. Ohio State didn't get the points out of him they needed last year, and his first three probable matches this year present a winnable but challenging slate. He opens versus Ebed Jarrell of Drexel, and if he advances would expect to see No. 5 Chance Marsteller of Lock Haven and No. 4 Evan Wick of Wisconsin. Ohio State's middleweights all took a beating in the tournament seeding, but with head coach Tom Ryan sitting on the committee it's hard for Buckeye fans to do much more than grumble. Redshirt freshman Ethan Smith opens his tournament versus Kimball Bastian of Utah Valley in a match the Buckeye should win, but then faces No. 3 Zahid Valencia of Arizona State in what would be one of the year's biggest upsets. Smith has backed down from no man in his debut campaign, however, so don't count him out on chalk alone. He nearly upset Michigan's Myles Amine earlier this season, and only looked outclasses against Penn State's Mark Hall, the undefeated defending NCAA champ. If he wants to pull off an All America finish as a freshman, Smith has his work cut out for him. But as another Latrobe native, he'll have plenty of motivation to outplace his seed in front of a Pennsylvania-heavy crowd. Ohio State's lone top-seed in this year's tournament is also the only man on the roster to have an NCAA Championship to his credit. He is also the only man on the team with a perfect record coming in to this tournament, and has the best shot of any Buckeye to finish atop the podium Saturday night. He already has victories over the No. 4, No. 5, No. 7 and No. 9 seeds in the tournament this year, and would expect either a rematch with No. 4 Emery Parker or No. 5 Max Dean in the semifinals before facing Penn State's Shakur Rasheed in the title match. Rasheed, you may recall, opted not to face Martin in the finals of the Big Ten Championships earlier this month in Minneapolis. The final match of the tournament in this bracket should be No. 1 Bo Nickal - your likely Hodge Trophy winner - and No. 2 Kollin Moore. Although Moore would up on the wrong side of former Kent State Golden Flash and future Nittany Lion Kyle Conel a year ago (twice), it's hard to imagine the wheels falling off the wagon for a second year in a row. Moore has just two losses this season, both to Nickal, and is 7-2 vs. nationally-ranked opponents with three major decisions among those victories. Singletary was the only Buckeye not to earn an automatic qualification to the NCAA Championships, but he was the first man off the board when At-Large bids were announced. He'll face Nebraska's No. 17 David Jensen in the first round, a match Singletary pulled out via a 7-5 decision earlier this year. Assuming he wins again Thursday, he'll advance to wrestle No. 1 seed Derek White of Oklahoma State. White's only loss on the season is to freshman phenom Gable Steveson of Minnesota, so sharp money suggests Singletary's path to a Top-8 finish lies in the wrestlebacks. Individual match scoring works pretty much the same in a tournament setting as it does in a dual meet: a takedown is worth 2 points, as is a reversal, while an escape is worth a single point and near-fall points come in pairs of 2 or 4. But how victories in those individual matches add to a team's score is fairly different from what fans are used to seeing in the dual meet season. Team points are accumulated at the NCAA Wrestling Championships in three basic categories: Placement Points, Advancement Points and Bonus Points. Placement Points are pretty straightforward: the wrestler earns his team a certain number of points based on his final placing in the tournament. Once a wrestler is guaranteed to finish no worse than 8th, the team is awarded those 3 points, and as he improves his placement, the team score improves accordingly. Advancement Points are the points the wrestler earns his team by simply winning matches. If he wins a match in the championship bracket, he earns a single point. Once he has dropped into the wrestlebacks, each victory is worth just 0.5 points, but points earned in the consolation bracket are extremely important to a team with championship aspirations. Ohio State needs every wrestler it can get competing on the final day of the tournament if it is to have any hope of catching Penn State in the team race. Bonus Points are similar to dual-meet bonus points in that they are tallied based on the margin of victory in the match. Each fall (or forfeit, default, disqualification) is worth 2 points in addition to the advancement point discussed above. A tech fall with near-fall points adds 1.5 points while a tech fall without near-fall points is the same as a major decision - each adds 1 bonus point. Penn State is not only projected to win the team's eight NCAA Championship in nine years, but to do so running away from the field. Based on seeding and ignoring bonus points, the Buckeyes are fighting "the other OSU" for second place. For the team to not only do that but to have a shot at drawing close to the Nittany Lions and their trio of top-seeds and handful of probable NCAA finalists, Ohio State needs Martin, Moore, McKenna and Jordan all wrestling in the finals Saturday night, and need to at least match last year's tally of eight All America placements. It's a tough row to hoe, any way you slice it. Talented freshmen Singletary, Smith and Heinselman have to punch well above their seed, and Te'Shan Campbell and Ke-Shawn Hayes have to win far more matches than they did a year ago in Cleveland. In a cruel bit of irony, Ohio State only had one individual NCAA Champion last year in Kyle Snyder, but finished with one of the highest second-place point totals in tournament history... This year the team could conceivably finish with as many as three NCAA Champions and still lose to the Nittany Lions by a considerable margin depending on how many men from each team are wrestling on the last day of the tournament. ESPN's broadcast coverage of the NCAA Wrestling Championships gets underway at Noon Thursday on ESPN U.